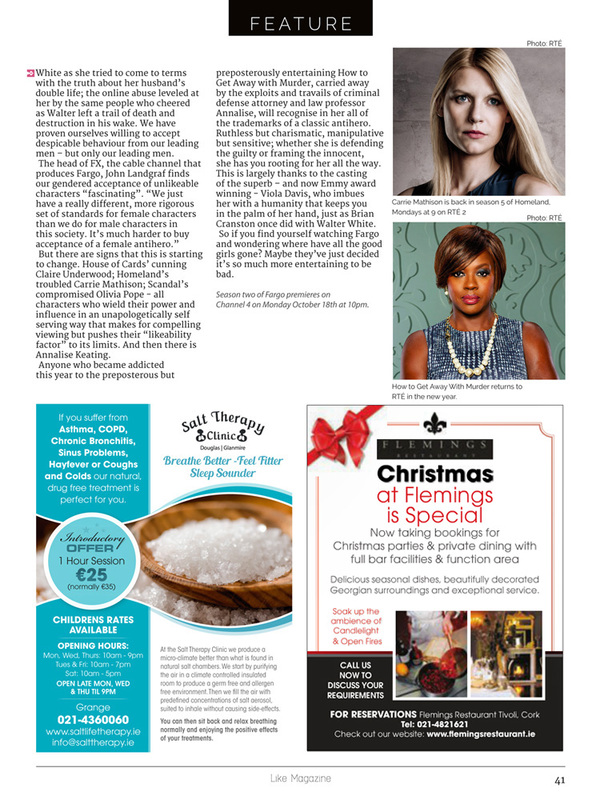 Celebrity feature, Like magazine, October 2015. Click to enlarge. Read below. 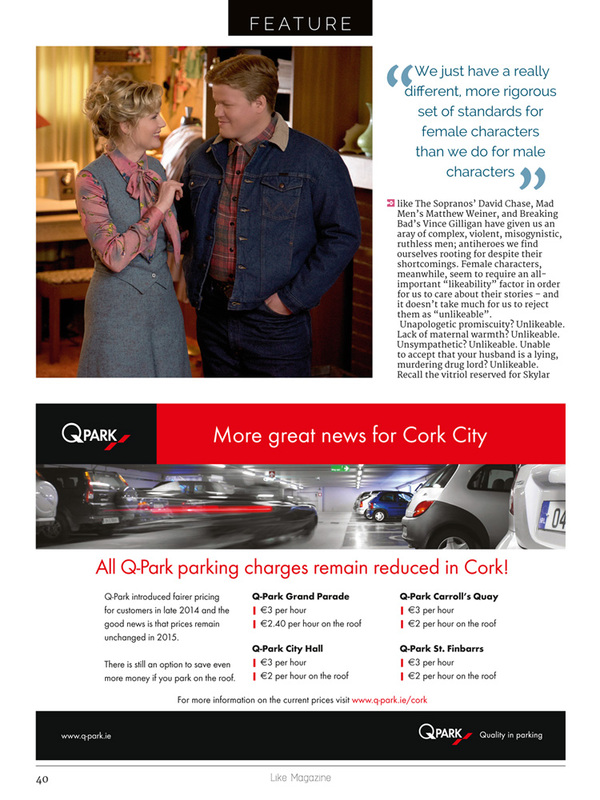 As Kirsten Dunst becomes the latest Hollywood star to step into our living rooms this month in the new series of acclaimed drama Fargo, Carolyn Moore looks at the appeal of the small screen for Hollywood’s big screen stars. “It feels almost more special right now to be on an exciting television show,” says Kirsten Dunst of her decision to become the latest Hollywood actress to make the switch to the small screen. Premiering on October 18th on Channel 4, season two of the acclaimed drama Fargo sees Dunst take on the role of Peggy Blomquist, a small town beautician with big city dreams who can’t help but think that there’s more to life than Luverne, Minnesota. Which seems to be a large part of the appeal for the growing number of bona fide movie stars who are now clamouring for space on a smaller screen. Though once the trajectory of stardom moved in the opposite direction, with TV stars viewing movie fame as the ultimate career goal, we are unquestionably in the midst of a “Golden Age of Television”, where prestige TV shows and mini-series now stand to garner more critical acclaim and accolades than even the most highbrow movie project. It’s also presenting, for women, an opportunity to explore characters infinitely more complex and layered than contemporary mainstream movies typically allow. “I can’t pinpoint exactly why, but this was one of the hardest roles I’ve ever played ,” Dunst reveals. And she has much to compare it to. As bona fide movie stars go, for an actress of her age Kirsten Dunst has exceptional credentials. At just 33, she has 26 years of acting experience under her belt and over 50 movie credits to her name, making her a veritable veteran of the industry. From an impactful debut aged 11 opposite Tom Cruise and Brad Pitt – “I peaked early,” she has joked of sharing her first kiss on screen with Pitt – in Neil Jordan’s Interview with the Vampire, she has gone on to star in everything from the blockbuster Spider-man franchise, to the quirky indie-hit Eternal Sunshine of the Spotless Mind, to the art-house masterpiece Melancholia. A teenage stint on ER and several made-for-TV movies mean Fargo is not her first foray into television, but it’s something she wouldn’t rule out repeating. “I’m not in a position right now where I would want to dedicate myself to a long-running series, but I would do another mini-series or a movie for television for sure,” she confirms. Shot in Calgary over five months, the new season of Fargo tells the story of the “Sioux Falls incident” alluded to in season one. While that season focused on the dogged detective Molly Solverson, season two rewinds to 1979 and turns the focus on her father, Lou, played by Patrick Wilson; his sheriff father-in-law, played by Danson; and a couple – Dunst and Plemons – who find themselves, in typically Fargo-eque fashion, inadvertently implicated in a mob war. “She’s kind of stuck,” Dunst reveals of the character. “In reality, she’s quite delusional about what she hopes to accomplish. What happens in the first episode, though, kind of spins her off a little bit. But when it comes to making her dreams come true, what is Peggy capable of? While the intricacies of the plot and characters remain shrouded in secrecy, the teaser trailer for season two shows Peggy frantically washing blood red hair dye from her hands, clearly haunted by something she has seen… or perhaps done. If the latter proves true, Fargo might be about to give us something so lacking from the current television landscape – a female antihero. In this golden age of television, showrunners like The Sopranos’ David Chase, Mad Men’s Matthew Weiner, and Breaking Bad’s Vince Gilligan have given us an array of complex, violent, misogynistic, ruthless men; antiheroes we find ourselves rooting for despite their shortcomings. Female characters, meanwhile, seem to require an all-important “likeability” factor in order for us to care about their stories – and it doesn’t take much for us to reject them as “unlikeable”. Unapologetic promiscuity? Unlikeable. Lack of maternal warmth? Unlikeable. Unsympathetic? Unlikeable. Unable to accept that your husband is a lying, murdering drug lord? Unlikeable. Recall the vitriol reserved for Skylar White as she tried to come to terms with the truth about her husband’s double life; the online abuse levelled at her by the same people who cheered as Walter left a trail of death and destruction in his wake. We have proven ourselves willing to accept despicable behaviour from our leading men – but only our leading men. But there are signs that this is starting to change. House of Cards’ cunning Claire Underwood; Homeland’s troubled Carrie Mathison; Scandal’s compromised Olivia Pope – all characters who wield their power and influence in an unapologetically self serving way that makes for compelling viewing but pushes their “likeability factor” to its limits. And then there is Annalise Keating. Anyone who became addicted this year to the preposterous but preposterously entertaining How to Get Away with Murder, carried away by the exploits and travails of criminal defence attorney and law professor Annalise, will recognise in her all of the trademarks of a classic antihero. Ruthless but charismatic, manipulative but sensitive; whether she is defending the guilty or framing the innocent, she has you rooting for her all the way. This is largely thanks to the casting of the superb – and now Emmy award winning – Viola Davis, who imbues her with a humanity that keeps you in the palm of her hand, just as Brian Cranston once did with Walter White. So if you find yourself watching Fargo and wondering where have all the good girls gone? Maybe they’ve just decided it’s so much more entertaining to be bad. 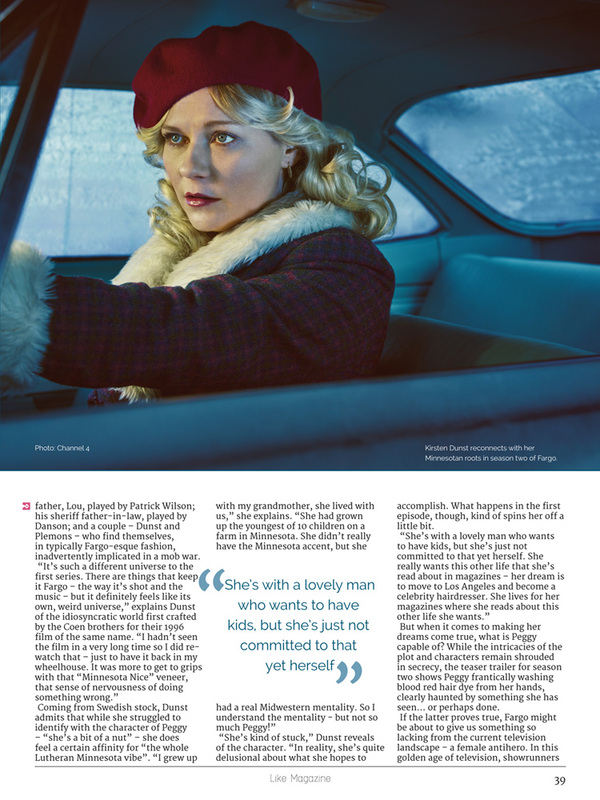 Season two of Fargo premieres on Channel 4 on Monday October 18th at 10pm.